In order to specify the “Atmosphere/Ionosphere” application related input, the user opens either an *.atmosphere- or *.ionosphere-file in the editor shown in the figure below. Model-Display: a model display analysis provides atmosphere (or ionosphere) and wind characteristics such as number of density and temperature from the models. 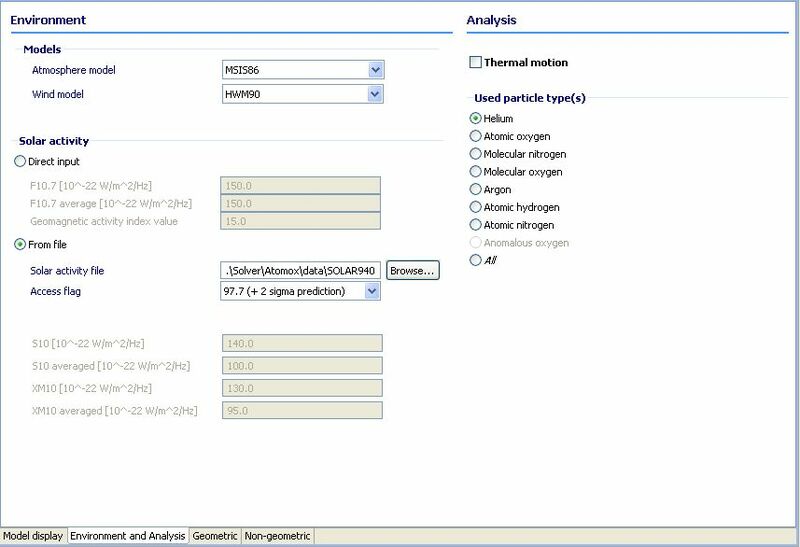 Environment and Analysis: properties for the models, solar activity and the particle types used for geometric and non-geometric analyses. Geometric: configuration of the number of rays, spinning and multiple reflection for the geometric analysis. Non-geometrical analysis: parameters for the fixed (in-orbit oriented) plate analysis.